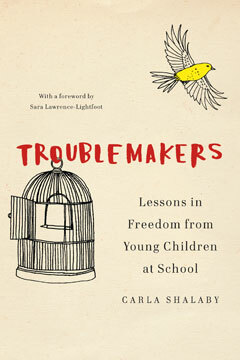 From Zora’s proud individuality to Marcus’s open willfulness, from Sean’s struggle with authority to Lucas’s tenacious imagination, comes profound insight—for educators and parents alike—into how schools engender, exclude, and then try to erase trouble, right along with the young people accused of making it. And although the harsh disciplining of adolescent behavior has been called out as part of a school-to-prison pipeline, the children we meet in these pages demonstrate how a child’s path to excessive punishment and exclusion in fact begins at a much younger age. Shalaby’s empathetic, discerning, and elegant prose gives us a deeply textured look at what noncompliance signals about the environments we require students to adapt to in our schools. Both urgent and timely, this paradigm-shifting book challenges our typical expectations for young children and with principled affection reveals how these demands—despite good intentions—work to undermine the pursuit of a free and just society.